The surge of populism across Europe and the US has been accompanied by an increasingly flexible relationship of many people - including presidents - towards facts and truthfulness. "Postfactualism" is dangerous for democracy - it can undermine its legitimacy as well as that of the institutions that enable it, such as the media. Hence, we're launching the Faktenfreunde ("friends of facts"), a network for people who remain keen on the facts. Armed with the facts, any debate becomes easier - and better. Facts still matter. We want to make sure it stays that way. From Adorno and Horkheimer to Joseph Stiglitz to Hans Rosling; from the economic developments underpinning increasing discontent in countries such as Germany to gender roles in different religious communities in Europe to historical perspectives on the political consequences of migration: we'll talk about it, constructively and based on the facts - while acknowledging ambiguity and uncertainty. Our crowdfunding campaign has ended: Thank You! We're extremely grateful to the 50 of you who have generously supported our crowdfunding campaign "Make Democracy Great Again (One T-Shirt At a Time)" - and the countless others who have supported our work in a myriad of other ways over the past year. Thank you! 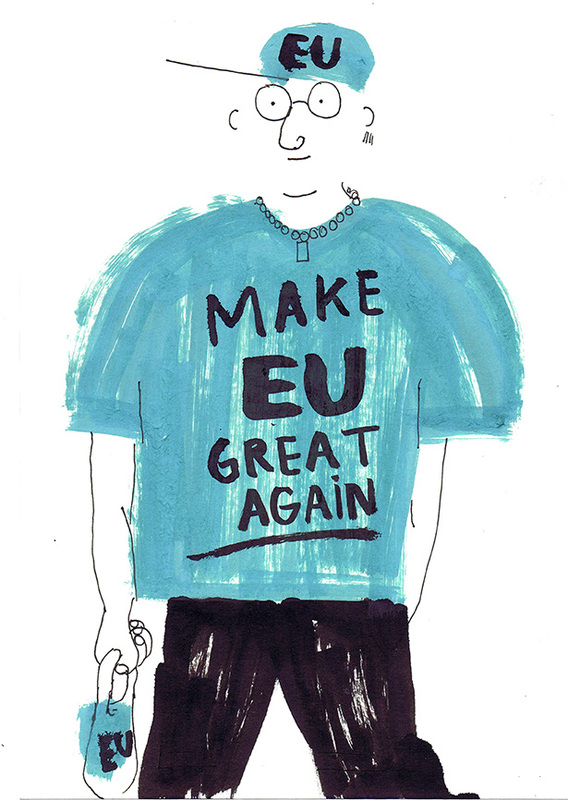 We still have some T-Shirts left (with "Make Democracy Great Again" or "Make EU Great Again" graphics, available for men and women in different sizes), so please do write to us if you're interested. For some impressions of what the Friends of Integrale look like in their T-Shirts, please see below. On Sunday, September 24th, 2017, federal elections took place in Germany - an important day for the many people who have worked with us and other organisations to promote democracy, counter populist sentiment and encourage dialogue across partisan and social divides. To mark this day and express our gratitude for all the hours that our activists and volunteers had spent "fighting" for democracy in the weeks and months leading up the election, we hosted an election night party at the Kantine at Berghain in Berlin together with Kleiner Fünf, Das Progressive Zentrum, Die Offene Gesellschaft and x-weise. The results of the election - with 13% of the country-wide vote going to a party ("AfD") that has embraced clearly divisive and in parts openly xenophobic, racist, revisionist, anti-islamic and anti-semitic rhetoric, and which will now be represented in the German Bundestag - mark a sea change in German politics. They also meant that our election night event was a rather subdued affair, although it was also reassuring insofar as the more than 200 people present reaffirmed their commitment to be (even more) active in promoting democracy and dialogue in the future. The outcome of this election will no doubt have an impact on our work and that of the many other brilliant organisations who have taken a stand against the kind of politics and rhetoric that the AfD represent. Nonetheless, one thing became abundantly clear during our event: our work has only just started. The next elections are just four years away. If you would like to get involved, write to us. The amazing illustrations developed by our brilliant team of graphic recorders (Romy Blümel, Doris Freigofas, Kati Szilágyi, Tiziana Jill Beck, Christoph Vieweg) during our recent event "Aktionswochenende" ("action weekend") on understanding and countering populism are now available online here. Do have a look - the illustrations provide a truly fascinating and novel perspective on the topics of populism and political participation. The Guerrilla Foundation is feeling hopeful rather than dejected this year - in part due to our recent "Aktionswochenende" (action weekend). We're hopeful, too - and very grateful to The Guerrilla Foundation for their amazing support of our event. A group of students and professionals are hosting an "Aktionstag" or "action day" on Sunday, the 26th of February 2017, in Freiburg - the objective is to develop concrete ideas and action plans on what to do to oppose populist tendencies locally. To find out more, write to us: hello@die-integrale.org. We hosted an "Aktionswochenende" or "action weekend" – from the 27th to 29th of January, 2017, in Berlin – in order to develop concrete ideas on what all of us, as citizens, can do to address the worrying rise in and political space given to populist, fascist, racist, sexist and partially anti-democratic movements in the US, UK, Germany and other European countries. For the weekend, we brought together a diverse bunch of people from a range of different backgrounds - including academics, professionals and politicians - who are united in their commitment to engage with these developments to dedicate a weekend to, initially, understanding, through a variety of interdisciplinary approaches, what is behind the growing appeal of populism, and then determining what all of us can do. Our objective was to develop concrete, actionable and ideally scalable initiatives - and at least three distinct new initiatives as well as a lot of support for existing initiatives have grown out of the weekend! If you're interested in finding out more about our conclusions from the weekend, write to us: aktionswochenende@die-integrale.org.